Too much of good thing can be a bad thing – that’s why Hydro Dynamics introduced its Landscape Drainage Department early in the 1980s. Improper water drainage can damage your home’s structural integrity and valuable interior contents. It can even negatively impact the quality of the air you and your family breathe. Hydro Dynamics’ techs are the top St. Louis drainage experts. 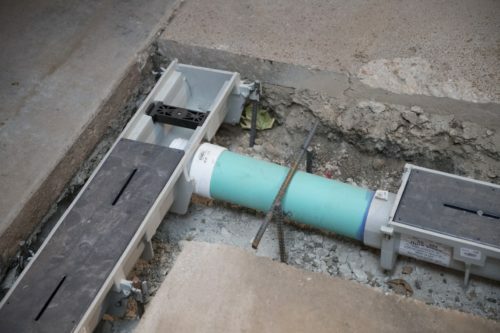 With nearly 40 years of experience in the industry, Hydro Dynamics will assess your home and your property’s individual characteristics to design a custom drainage system that will eliminate any current or future issues that may arise. Proper drainage lays the groundwork for creating gorgeous, functional outdoor living spaces. It can divert water away from your house in order to maximize the usability and health of your space, for a sustainable solution that will support the growth and development of your yard. No matter what your vision, Hydro Dynamics will develop a custom system to solve your drainage problems. In addition to creating a healthy environment for your lawn, proper drainage lays the foundation for a wide variety of options when it comes to further enhancing your outdoor areas. Don’t take chances with inexperienced or sloppy companies—we at Hydro Dynamics have always prided ourselves on our honest, quality, and superior work. We always leave your yard better looking and functioning than we found it. Whether you’re dealing with excess storm water, a flooded yard, soil erosion, or any other landscape drainage issues, our experts in creating exterior water drainage systems can help. Contact us to set up an appointment today! Whether your looking for a free estimate or have a question about our past work, we would love to hear from you! Please enter some information below and someone from our office will be in touch shortly.